In addition to the many wonderful things that Fall brings such as colorful leaves, the first feelings of the cool Fall breeze and pumpkin spice everything; October is also National Animal Safety and Protection Month. This month was dedicated to creating awareness of safety and protection for domestic as well as wild animals as a reminder that we can have an effect on everything in our environment and we are the stewards of the animals on this earth with us. During this month you will see many animal shelters, pet stores and veterinarians promoting safety awareness for animals. This is a good time to ask about the many ways you can protect your pets. Most people wouldn’t think of pet proofing their home much in the same way as baby proofing. There are many toxic and dangerous things that a pet can get into, especially the really curious ones! Please click here for an extensive list. Always keep dangerous chemicals locked away where any pets can’t get to them. Also be sure when no one is home your pet is safe and to look around your home for anything they can get into while you are out. Funny enough they know when you are not looking! Even though we have gotten through the dog days of summer and being careful not to leave pets in the car during summer heat; the safety of your pets changes with each season including temperature, new pests and insects to be aware of and new items coming in the home due to seasonal needs. 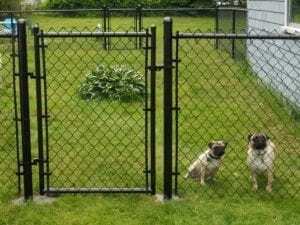 Another often unexpected element is insuring that the fencing around your yard is secured so that your pet cannot get out or other animals cannot get in. It is surprising how perfectly sturdy looking fences can succumb to an excitable, barking dog that is doing everything he/she can to protect and scare away intruders or squirrels from his territory. 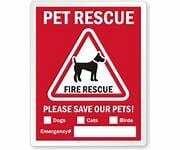 Another item that is wonderful to have is the fire sticker below to indicate to emergency responders that there are pets in your home so they will immediately know. These can be ordered online. Also as travel season is increasing due to holidays, it is a good time to ensure your travels with your pets are safe for them. A safe and secure carrier is key when traveling with pets in a car or by air. Be sure you have provided with them fresh water, especially on a long trip to avoid dehydration which then can cause your pet to a series of very serious symptoms that could have been avoided. There are so many great travel carriers available online to meet any need and style. So take a moment this month and check if there is anything you can do to insure your pet’s safety and perhaps even the safety of any other animals you may have contact with. We can all do our part to avoid unnecessary and preventable harm to our pets and animals we love. With so many resources at our fingertips, it is easier than ever to get the help and advice needed for any scenario. Call us to learn how we can help protect your pet with our Genetic Preservation service at 888-876-6104.